The McHale 998 square bale wrapper is the versatile high output solution for wrapping square bales. It is capable of wrapping 80 – 100 bales per hour. Common sense design, quality components and precision engineering make the 998 square bale wrapper the trusted choice for contractors and farmers who demand high output and consistent performance in all conditions and terrain. Load one square bale onto the front conveyor. Move a second square bale from the front conveyor into the wrapping position. Eject the last wrapped square bale off the back of the 998 square bale wrapper. The 998 square bale wrapper is packed with features including conveyor loading and fast positioning of the square bale into the bale wrapping position, hydraulically operated cut and tie system, auto square bale levelling and a two point linkage mounted swivel head-stock. The 998 wraps all sizes of square bale from 80cm x 70cm to 160cm x 120cm including double square bales. The in-cab control unit enables the operator to change square bale sizes and select the desired number of film layers to be applied by the square bale wrapper. When set, one touch of the auto start button operates the complete cycle from start to finish. The patented roller angle-measuring device on the 998 square bale wrapper measures the corners of the bale and through this determines the correct number of satellite rotations. This patented system, ensures a consistent and even bale wrapping cycle where the required overlap is acheived, regardless of the square bale size or shape. The 998 operator can also select extra care wrapping, which makes the McHale 998 square bale wrapper apply additional plastic on the corners of the bale. The front loading conveyor on the 998 square bale wrapper allows for effortless square bale loading. The conveyor can also be used to carry the next square bale as the machine finishes the wrapping process. Once the square bale is wrapped it is automatically levelled and then placed back on the central conveyor and can be unloaded off the back of the 998 square bale wrapper. The 998 square bale wrapper features a patented roller angles measuring system, which gives a consistent and even wrap regardless of square bale size or shape. The patented roller angle measuring system, on the 998 square bale wrapper also allows for extra care wrapping. When extra care is selected in the control box, bale rotation is slowed down at the corners of the bale and additional plastic is applied which ensures good quality square bales of silage. The patented oscillating rollers on the 998 square bale wrapper cradles the bale between the rollers as it is being wrapped. The oscillating rollers rotate the square bale at a uniform pace ensuring that the square bale receives the correct overlap, which ensures a tight seal and a high quality finish square bale of silage. 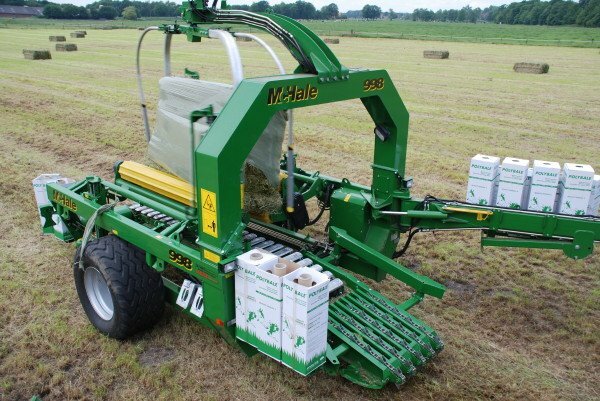 The McHale 998 square bale wrapper features two 750mm aluminium dispensers. The dispensers maintain a consistent stretch, which maximises film usage. The dispenser unit consists of two aluminium rollers, which are geared to each other with robust steel gears of different ratios. The units are designed so that the angle that they work at during the wrapping cycles stays constant. This gives a more even stretch through the roll of film. The dispenser units also feature a McHale quick fit plastic loading system to make film changing much more user friendly on the 998 square bale wrapper. On the McHale 998 square bale wrapper the dispenser’s lock and load system makes film loading really easy. When removing the core of the used roll of plastic the dispenser bobbin locks in place. When a new roll of plastic is in the loading position, it can be locked in place by simply pulling the cord on the dispenser of the 998 square bale wrapper. The McHale 998 square bale wrapper has a fully integrated PTO driven load sensing hydraulic system. This simplifies tractor change over and delivers consistent performance, eliminating problems associated with different tractor hydraulic systems, oil flows and oil temperatures. The stand alone load sensing hydraulic system also reduces the risk of oil contamination. The 998 square bale wrapper features an in cab control console, which enables the operator to change the bale size and select the desired number of film layers to be applied to the square bale. When set, one touch of the auto start button operates the complete cycle from start to finish. From the control console the operator can select the wrap start position and can also customise the wrapping programme which allows the operator to apply more plastic at eight points on the surface of the bale and store the customised programme for later jobs which have the same bale size. Should you wish to use the McHale 998 square bale wrapper for static wrapping, a remote control kit is available. This allows the machine to be used as a static machine. Here an operator can load the 998 square bale wrapper using a loader and activate an automatic cycle on the 998 square bale wrapper by using the remote control While the square bale is wrapping the operator can collect the next square bale and load it on the front conveyor. When the wrapping cycle is complete the wrapped square bale can be removed and the next bale can be wrapped with a simple click of the remote control. As with all McHale bale wrappers the reliability of the cut and hold systems is of the utmost importance. The 998 square bale wrapper, collects the film in the cut and hold rails and then gathers it to one point where it is held and then cut. This system ensures better grip and provides more consistent superior performance, particularly when the 998 square bale wrapper is working in hot or wet conditions. Edward Taylor runs a contracting business and mixed farm with his brother Greg in Lancashire. Contracting has been in their family for over 30 years since their father first started operating in 1979.